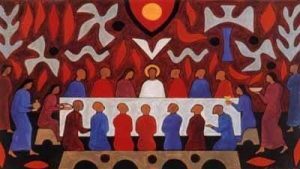 The Church on the Green and Watchung Presbyterian Church will worship together on Maundy Thursday, March 29, 8PM in our Chapel. All are welcome. We will gather at the Lord’s Table for the Sacrament of Holy Communion and then follow our Lord to the Garden of Gethsemane, the Judgment Hall, and along the Way of the Cross to Calvary. The solemn Tenebrae “Service of Shadows” will end in darkness.